Apple Graphics just completed our latest wrap for 'The Barcoed.com'. They are an internet marketing company for nightlife and entertainment in Philadelphia and its surrounding areas. The wrap was a huge success and the business owners were thrilled with the final product. 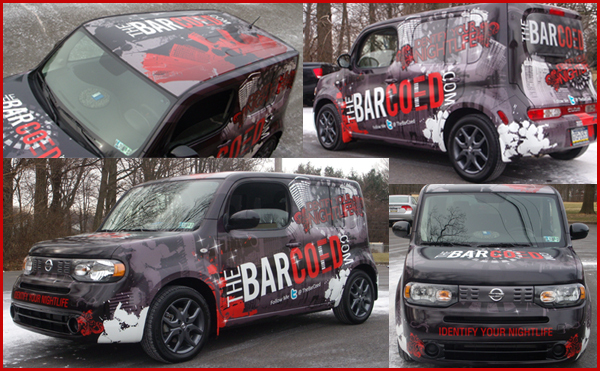 The Barcoed.com teamed up with Apple Graphics and All-Star Nissan of Devon in order to wrap their new Nissan Cube. They were not only looking to purchase a new vehicle for their company, but also wanted to get it wrapped with an attention grabbing design. The Barcoed.com found that All-Star Nissan was one of the dealerships that include a vehicle wrap in with the financing for the vehicle. They purchased a 2010 Nissan Cube to be their mobile advertisement. Not long after they drove the Cube out of the dealership lot, the same vehicle was pulled out of our shop completely wrapped! All-Star Nissan of Devon is just one of many car dealerships that are involved in financing vehicle wraps. Any business interested in purchasing a new company vehicle and wants to wrap it, this is the best way to do it. Instead of paying all at once, you can spread out your payments and make it more affordable for you! Colonial Nissan of Feasterville, Holberts Volkswagon of Warrington, Fleetway of Feasterville, Willis Honda of Burlington, NJ, and John Kennedy Ford of Feasterville are a few more dealerships in the area that finance vehicle wraps. These dealerships will finance any form of a wrap for the newly purchased vehicle; a full vehicle wrap, partial wrap, perforated window film, and vinyl lettering and graphics. For businesses that already have their company vehicles but cant afford to wrap them, we have financing companies that can help. Axis Capital Inc is one of the financing companies that have teamed up with Apple Graphics. Apple Graphics has gained great relations with numerous car dealerships in the Philadelphia area. They are all involved in vehicle wrap financing. Call and find out more information on this great opportunity!